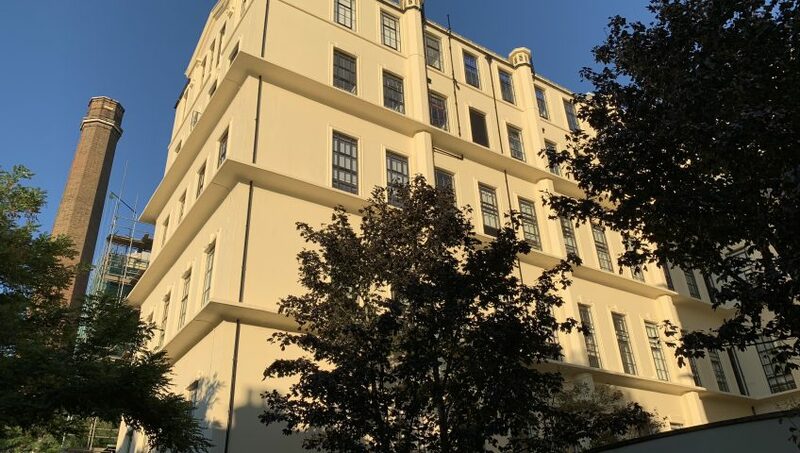 Structural Renovations will shortly be completing a 6 month contract to repair and protect the external elevations of this very large and impressive building, constructed between 1909 and 1911 in a style of architecture known as Beaux Arts. Originally built to house the GPO Money Order Office, it was sold in the 1990’s by the Royal Mail for redevelopment and converted in to 190 flats in 1994. The building is now recognised as one of the most important in the area. Our works have included surveying all concrete and render surfaces to establish the condition, followed by carrying out sympathetic repairs using polymer modified mortars. All areas have then received a primer followed by 2 applications of a pigmented anti-carbonation coating to protect the structure from the atmosphere. In addition to the repair and coating works a significant amount of the original Crittal windows have been replaced to an approved design that the local authority has been closely involved with, to ensure that this significant example of an architectural style more likely to be found in France (Ecole des Beaux Arts, Paris), or further afield in the USA (Grand Central Station, NYC). The windows that haven’t been replaced have been redecorated along with all other existing metalwork, guttering and rainwater pipes. Furthermore the roof level ‘pods’ have been waterproofed using Sika’s Sikalastic 625 and a number of terraces waterproofed with Sika’s Sikalastic Rapid 721.